Saudi Arabia and the United Arab Emirates (UAE) are reportedly recruiting thousands of African mercenaries to serve in their military adventurism overseas, including the bloody war on Yemen. Saudi sources told the al-Quds al-Arabi newspaper that the kingdom is likely using Chadian mercenaries in its operations abroad. They said the speculation had gained more credence after Chad’s President Idriss Déby traveled to Saudi Arabia earlier in the month to observe the Joint [Persian] Gulf Shield-1 military drills in the eastern Saudi city of Jubail. The kingdom has signed secret agreements with N’Djamena, enabling its enlistment of thousands of Chadian mercenaries, according to the sources. The UAE is, meanwhile, seeking to recruit thousands of mercenaries from Uganda to deploy in Yemen and Somalia, Yemen’s al-Masirah television network reported, citing Arabic media outlets. The Emirates is Saudi Arabia’s most senior partner in the war on Yemen, which has been raging since March 2015 to return the impoverished country’s Riyadh-allied former government. 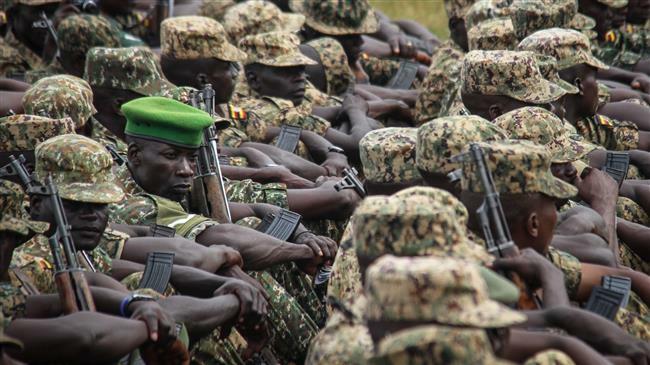 The countries have already recruited thousands of mercenaries, and the UAE is eyeing Ugandan recruits amid the prospect of Sudan’s withdrawal of its forces from the Saudi-led coalition. Abu Dhabi Crown Prince Mohammed bin Zayed Al Nahyan is reportedly to travel to Uganda to sign several agreements bringing 10,000 Ugandan forces into Emirati ranks. Informed sources said 8,000 of the forces would be deployed in Yemen, and the rest in Somalia, where the UAE has been militarily active. Thousands have either died or been displaced as a result of the Saudi-led coalition’s offensive in Yemen. Western powers had proposed that Saudi Arabia ink military cooperation agreements with Chad in order to bring Riyadh closer to the African nations, which enjoy good ties with Israel. The kingdom does not officially recognize Israel, but the two are widely reported to have cooperated behind the scenes for years. Speaking to the pan-Arab al-Hewar television channel, dissident Saudi prince Khalid bin Farhan Al Saud revealed on April 5 a series of “conditions” set by the US and Israel for bin Salman so he can secure their help in ascending to the throne. The conditions, he said, included normalization of Riyadh’s ties with the regime in Tel Aviv.